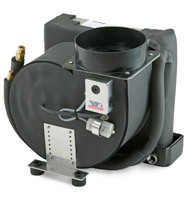 EBDE series evaporators are draw-through, ductable cooling and heating units with variable speed blower and enclosed in an insulated aluminum housing with integrated condensate drain pan. EBDE units are designed to be installed in a cabinet or other enclosed space with discharge air ducted to grilles high in the cabin. EBDE models are available in capacities from 30,000 to 72,000 BUT/hr, and can be used with Cruisair Emerald R-410A condensing units. 230V/60Hz models are standard, but 50Hz models are available by special order. EBDE Series R-410A Evaporators Specs. 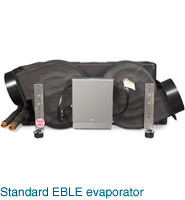 Compact EBE split evaporators are draw-through, ductable cooling units with reverse-cycle heating. Featuring a rotatable, high-efficiency permanent split capacitor (PSC) blower in which the motor is concealed, EBE series evaporators are available in capacities from 6K to 36K BTU/hr. EBHE units have electric heat. The EBE Series was designed for installation low in a closet, cabinet, or other enclosed space, with discharge air ducted to one or more grilles high in the cabin. EBE Series R-410A Evaporators Specs. 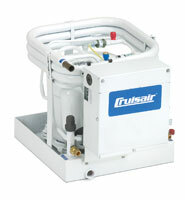 Cruisair's EBLE low-profile, dual-blower series of ductable evaporators are available in a wide range of capacities and configurations. Available in capacities from 12,000 to 36,000 BTU/hr, EBLE units are designed for installations where there is limited vertical space, such as beneath a seat or bunk or in overhead spaces. Standard EBLE units consist of a low-profile coil mounted on a deep drain pan with two high-efficiency permanent split capacitor (PSC) blowers drawing air across the coil. 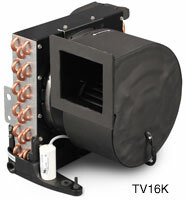 The variable-speed blower motors are internal to reduce noise and depth. 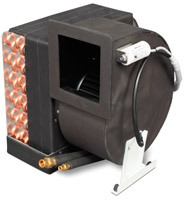 EBLEP models have an insulated return-air plenum for overhead applications. 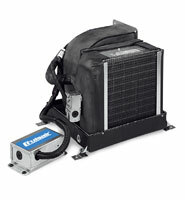 EBHLE models have auxiliary electric heat and are available with insulated return-air plenum (EBHLEP models). EBLE Low-Profile Series Evaporators Specs. Emerald Install & Operating Manual. 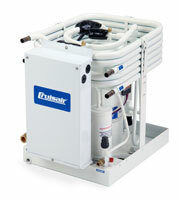 EMB and EHMB are ductable cooling units with built-in refrigerant solenoid valves and high-efficiency blowers. They are used with RM modulating condensing units, which allow up to five independent temperature-controlled zones on one condenser. They are designed to be installed low in a closet or cabinet, with discharge air ducted to grills high in the cabin. Units are available in capacities from 4,000 to 16,000 Btu/hr. 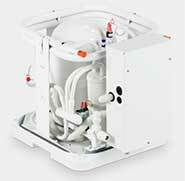 R-type marine HVAC condensing units are seawater-cooled, reverse-cycle heat pumps for cooling and heating in marine applications. These condensing units can be installed with up to 2 cooling units, where the total capacity is equal to the condensing unit capacity. Units can be installed in the vessel's engine room or other mechanical space, and are not affected by moisture, normal vibration, or ambient temperatures up to 140 degrees F (60 degrees C). No ventilation is required. Three different models are available to accommodate different types of controls. "R" uses the 3-knob rotary switch assembly. "RX" uses the SMX II digital control. "RN" uses the SMX Net digital control. REU remote evaporators are draw-through, ductable cooling units with rotatable, variable-speed blowers and integral water-displacing condensate pans. Featuring a high-efficiency permanent split capacitor (PSC) blower in which the motor is concealed, the REU series is available in capacities from 4-16K BTU/hr (20, 24, 30, and 36k units use a shaded pole motor). The REU series was designed for installation low in a closet, cabinet, or other enclosed space, with discharge air ducted to one or more grilles high in the cabin. 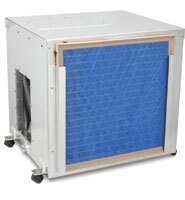 One or two evaporators can be used with a single condensing unit of matched capacity. Please contact the Applications department for assistance in design prior to installation. The new RM model remote modulating condensing units are the next generation of direct-expansion, cooling-only air conditioning units designed to run multiple cooling units (evaporators) with up to five independent zones. Models are available in capacities of 24, 30 & 42,000 BTU/Hr. Total cooling unit capacity should be within 15% of the condensing unit capacity. The RM Series' high-efficiency compressors deliver full capacity even under heavy loads. The newly designed, one-piece electrical box with 3' (1m) cable can be remote mounted simply by removing one screw. Additional service ports have been added for ease of charging and servicing. The one-piece chassis/pan has two new drain locations. New style hold-down brackets secure all four corners and allow for easier installation and removal. The TurboVap Series of direct expansion (DX) split-system evaporators is based on the revolutionary engineering advancements of the award-winning Turbo self-contained air conditioning system. Featuring a rust-free molded composite drain pan, condensate water is rapidly removed at one of two easy-to-plumb drain locations. The pan also has innovatively designed anti-slosh ridges and positive-flow channels to ensure condensate does not spill even in the roughest seas. TurboVap evaportors work with R-417A, R-22, and Emerald R-410A condensers.